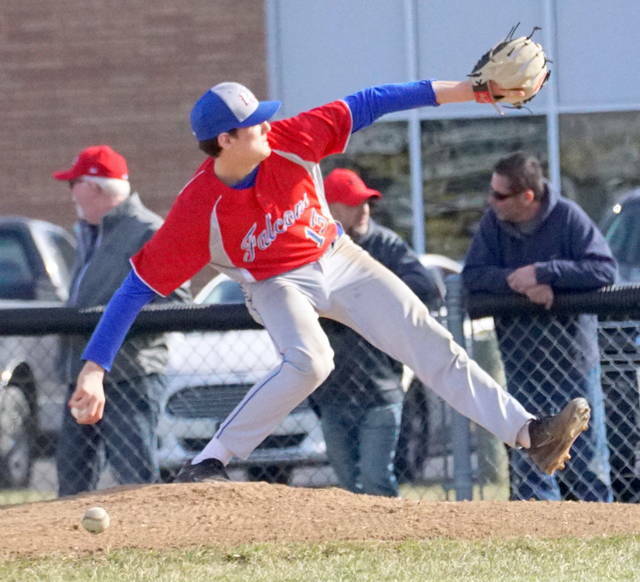 ADAMS TOWNSHIP – In an early season battle of SBAAC American Division unbeatens, Clinton-Massie defeated Goshen 5-2 behind a 14-strikeout performance by Luke Chappie. Clinton-Massie is 4-3 overall and 3-0 in the American Division. Goshen is 4-3 and 2-1 in the conference. New Richmond also is 2-1 in the American. Playing at Paul Schwamberger Field, the Falcons got off to a fast start with four runs in the first. Chappie (1-0) pitched one out into the seventh then turned it over to Bryan Kennedy who recorded the final two outs for his first save of the season. Seth Goodall had three hits for the Falcons and Chappie collected two. (5) CLINTON-MASSIE (ab-r-h-rbi) Lewis 4-1-1-0 Chappie 4-1-2-0 Goodall 4-1-3-1 Kennedy 3-1-1-1 May 3-0-0-1 Branham 3-0-1-1 Kerns 2-0-1-0 Clutter 2-0-0-0 Zantene 1-0-0-0 Stotts 2-1-0-0.